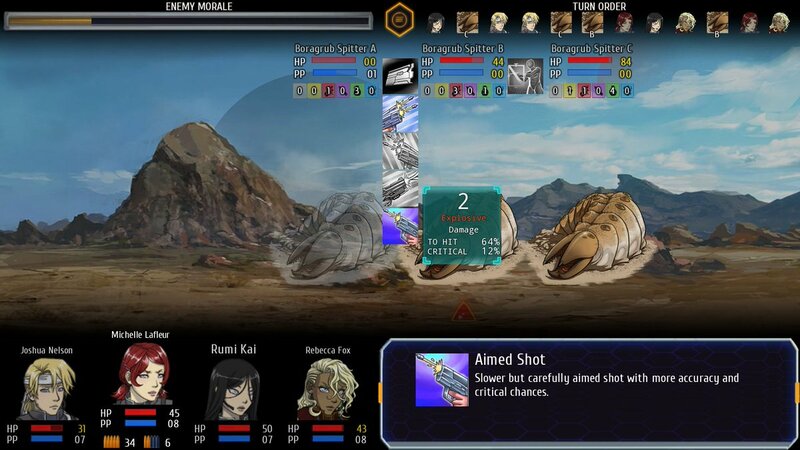 the targeting / dmg preview GUI now looks more sci-fi. I have added some animations but I've been careful to not delay the resposivity (I made some tests and even if I could add some nice fading effects players will want to see the damage info immediately). The font is an improvement. However, to make it look more like an targeingt reticle, the green background could be removed. If I remove the green background the text is unreadable. Believe me I made TONS of tests I had a much sci-fi looking version but you couldn't read the texts so I had to change it, since that's the most important thing. made a video showing a bit how the combat works and the difference that makes equipping the "right" weapon. 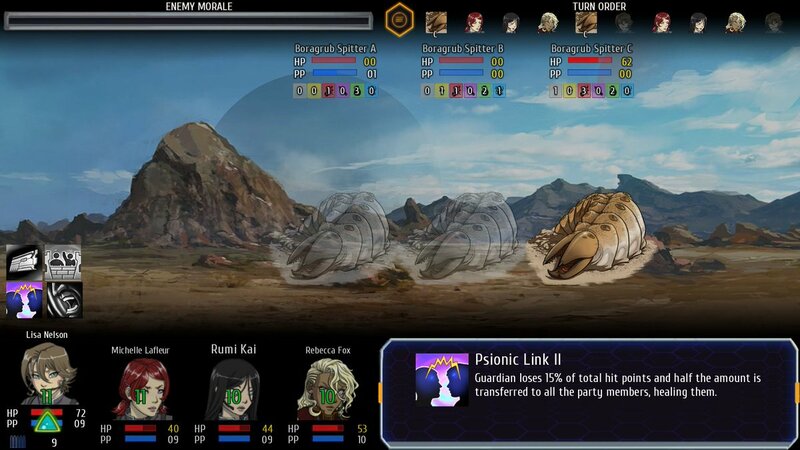 The level will be the most important thing, but also the damage type will have impact of course. 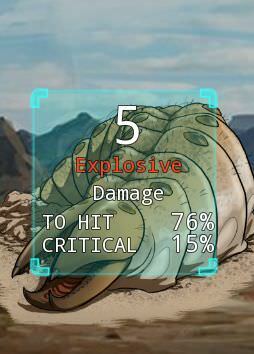 The damage preview should be readable without the green background, and wouldn't really be much different from the battle UI in Cursed Lands, which seems to use a similar text. For the rest of the text, which uses a smaller font size, I could see your point. Using abbreviations and all capital letters (ex: CRIT, DMG, etc) could be used to make room for larger text size though. In the latest video, the giant boragrub uses "melee attack" with a even smaller font size and no text box to aid in readability. Last edited by Jaeger on Tue Jun 12, 2018 2:44 pm, edited 1 time in total. here are tests I did using the same GUI but with a more transparent background. I personally think it's bad (my eyes hurt trying to read it, even the bigger texts ). Remember that players don't see so zoomed in. As for "melee attack" those are the skill names displayed so a different thing from targeting, I think that might work (maybe I will display a gradient to black overlay). 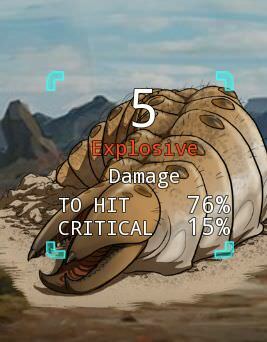 I'll will admit that the damage type ("Explosives") is rather hard to read due to the darker color. However, I think the whiter-colored text is okay. That being said, I actually like the image on the left more, it's transparent enough to make the make the enemy sprite visible but has some a little color that makes the text pop out a little more. Although "melee attack" is designated for a skill name, it would share same issue of readability, being on the same spot as the damage preview. Not to mention, it's using a even smaller text size and having short duration. As for the skills I checked and indeed it's different, uses a thicker black outline than the normal texts, so making it more readable. I will make the text bigger though in any case. All those things can be tweaked during testing of course. To be fair, the colored Explosive text is a little hard for me to read on your original screenshot too, which I assume wasn't zoomed in. Maybe the text color needs to be a few shades brighter? Of course, this is all on borugrubs, a brighter-colored enemy might make the rest of it hard to read. Yes lol that was the point: with a transparent background (or semi transparent) depends a lot on what kind of art there's behind it. A white/light text might be hard to read over a white/light enemy and so on. That's why I used that GUI image even if looks less "cool"